It's a GT500 factory splitter and the contours matches the GT/CS fascia perfectly. I might go this route instead. What do you think? It's about 70 bucks or so at the Ford dealer from what people have told me. Last edited by 2007CalSpec; 11/29/08 at 05:11 PM. I think its an excellent option. Probably the best that could be done really. The only problem I have with it is that at the bottom of our GT/CS front bumper covers, especially towards the ends where it meets the wheel wells, there is a bevelled edge that to me doesn't look right with a flat splitter sitting under it. It's almost like a mini chin spoiler molded into the front fascia on the two corners. I'm not sure the splitter looks right on there like that. I'm just thinking out loud here. I would like to see it in person really. It's OEM and that's good enough for me! I'm really liking that look. DO YOU THINK MAYBE THEY PAINTED OVER THE TEXTURE FINISH,LIKE THE LOWER BUMPER.LOOKS SOMEWHAT DULL. BUT A HECK OF ALOT BETTER THAN THE FACTORY FINISH.I'M GOING FOR IT. OFF THEY COME AND TO THE PAINT SHOP.UNLESS SOMEONE KNOWS OF A BETTER REPLACEMENT..
Are you talking about the mirrors? The mirrors look like they've been sanded smooth before painting. The center lip of the fascia looks kind of glossy so they probably painted it. Compare the center lip to the honeycomb pieces next to it and you'll see the difference. Last edited by 2007CalSpec; 11/29/08 at 05:18 PM. YES, I SEE THE DIFF. NOW .THANKS ,I GUESS I'LL SAND THE MIRRIORS SMOOTH.I HAVE ALL WINTER .BY THE WAY CALSPEC I INSTALLED THE LOWER GRILL IN MY CS AFTER SEEING YOURS ON THIS SITE ..THANKS MUCH ..
My lower grill? I never bought an aftermarket lower grill. I posted about the Silverhorseracing GT/CS lower grill but never got it. What I do have is a home made grill made out of gutter guard mesh from Home Depot. Cost me less than 2 bucks. The mesh openings are smaller than the honeycomb openings on our cars so it does a better job of deflecting road debris. 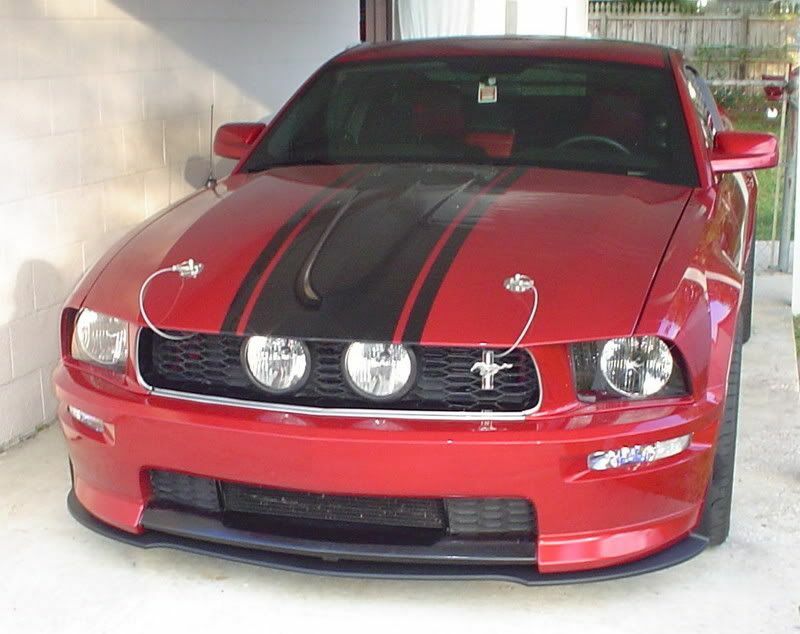 I've read that it took a lot of cutting and modding to get that splitter to fit on a GT bumper. Would it be the same for the CS? I wouldn't think so, the regular GT bumper is much different along that lower edge, it's more rounded along the bottom and has a large raised center area that really doesn't match up well to the GT500 piece. I want this for my car so bad. I wonder if the owner of the car pictured could chime in on the install? A front splitter should have been available for this bumper by now. Unfortunately my car is still bone stock. It just seems that Las Vegas has curbs and parking blocks, set 1 1/2 inches higher than what I was used to in Illinois. I've been out here for three years and still find a way to stop short, get out and make sure I have room still to park. The front plastic piece of the intrepid I used to have was gristle and that thing was a 4x4 compared to the Mustang. I found a write up on installing it but on the GT. I would imagine that it would be different from installing it on a CS but its a starting point i guess.